Disney’s live-action Mulan, and the Child’s Play and Charlie’s Angels reboots all pick up familiar faces. The CW’s superhero stars all hang out and answer burning questions. 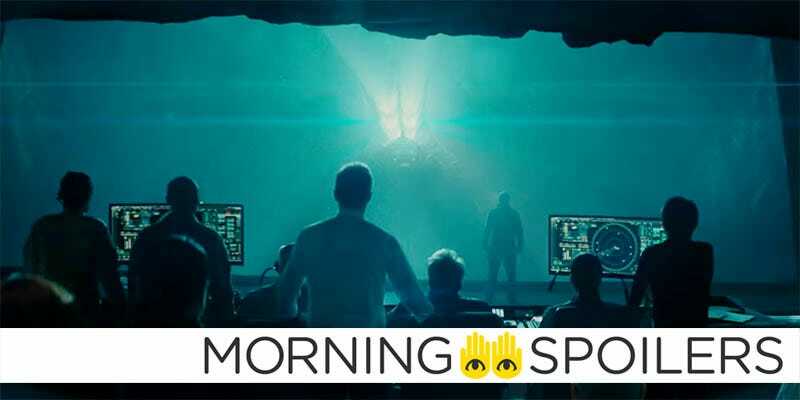 And our minds are reeling over Godzilla: King of Monsters’ connection to Kong: Skull Island in Legendary’s “Monsterverse.” Spoilers stomping this way! Variety reports Kristen Stewart, Naomi Scott, and Ella Balinska have been officially cast as the new Angels in Elizabeth Banks’ upcoming reboot. That Hashtag Show reports Liv Tyler is in talks to play Karen Barclay, a role originated by Catherine Hicks in the original. Justin Theroux is the latest to join the live-action Lady and the Tramp as the voice of the Tramp himself. Yahya Abdul-Mateen II confirmed Aqualad is not in the movie. We have a Donald Pleasence soundalike. Because obviously he’s no longer with us, but having someone that could mimic his voice was a fun challenge. And we nailed it, I think. If I do say so myself. And then there’s a couple other [nods to the past films]. There’s a vocal cameo you may or may not notice till the end credits. A film adaptation of Shirley Jackson’s The Lottery is now in development at Paramount. Jake Wade Wall will write the script, while Frank Marshall, Christine Holder, Mark Holder and Jackson’s son Laurence Hyman are set to produce. Deadline reports Hotel Transylvania’s Genndy Tartakovsky will direct two more animated films for Sony, an R-rated comedy titled Fixed and Black Knight, and adventure film. /Film has our first look at Natalie Portman as astronaut Lucy Cola. Empire has an exclusive poster. IMAX has a quick teaser for its exclusive, four-minute IMAX preview available only in theaters in front of Mission: Impossible - Fallout. Cody Fern has been cast as the elder Michael Langdon. The casts of Legends of Tomorrow and The Flash field questions in a pair of new livestream videos. Supergirl moves to Sundays with the Charmed reboot in a new promo. Finally, Tyrone and Tandy are finally ready to get down to business in the trailer for “Colony Collapse,” next week’s season finale (wait, really? ).